Every year around 100 million patients across the world develop scars1. So, it’s a common problem – but scars can also have a significant impact on people’s quality of life. 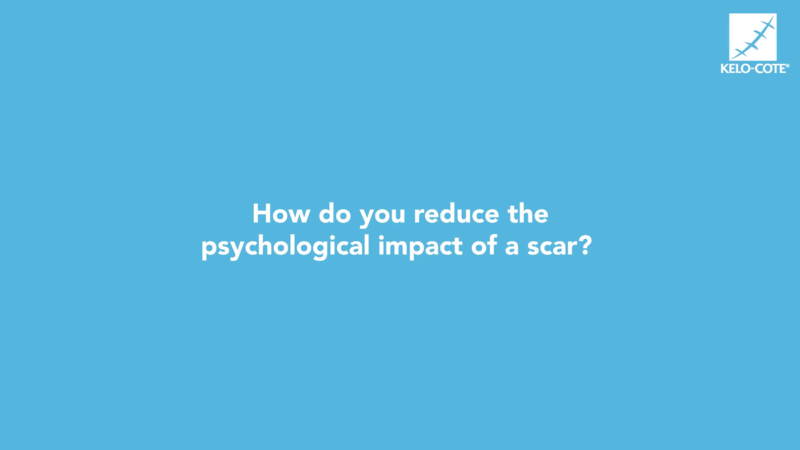 Research shows that scars affect patient’s psychological wellbeing2, which can lead to anxiety, social isolation and depression 3,4. If a burn, graze or a wound that cuts through deep layers of the skin hasn’t healed in 10-14 days, the reality is that it will form a scar. The sooner that you can accept this, the more able you are to move on to protecting and treating the scar to improve its appearance to the best possible point. However, a recent survey commissioned by KELO-COTE® revealed that 82% of people don’t realise that scars can be treated up to 2 years after the initial injury5. We also need to recognise that some situations are more emotionally and psychologically complex – such as scars caused by self-harm – and understand that these patients will need more professional help over a longer period of time. Self-harm is a growing mental health problem. Research has revealed, self-harm reported to GPs among teenage girls under the age of 17 in the UK increased by 68% over just three years6. It is often not until patients are fully recovered that they are in a position to accept their scarring and contemplate treatment. People’s reactions to visible scars can vary, with some asking intrusive questions and others staring awkwardly. This can be difficult at any time, but especially in already tense social situations such as a first date or job interview. In my experience, children whose parents encourage them to talk about their scars and answer other people’s often insensitive questions are more likely to accept and cope with their scars. The same is true of adults – and so finding your voice and being able to talk about your scars will help you to cope in the long term. There’s a misconception that men shouldn’t be concerned about the appearance of a scar – that it’s somehow not macho or that scars should be worn as a sign of “toughness”, like the clichéd male action hero. In reality, whilst men may want to show their scars with pride, men should also understand that it’s okay to say they don’t like their scars and that they want to treat them. Many people are rightly proud to show their visible scars. However, in some instances, people also feel more confident “covering” scars using cosmetic products known as camouflage. It’s not about hiding the scar, but about using make-up to make you feel more confident, physically, emotionally and mentally. We use cosmetics every day to improve the look and feel of our skin and hide blemishes or dark circles – so why should it be different with scars? KELO-COTE® Scar Gel UV with SPF 30 is an advanced formula silicone scar treatment, clinically proven to help soften and flatten raised scars as well as reducing discolouration and redness, protecting visible scars from the effects of the sun. The KELO-COTE® formula also binds to the skin’s surface creating an ultra-thin sheet which can give treatment and protection for scars for 24 hours per day. Once dry, sunscreen and make-up can be applied over the treatment area. It is recommended that sunscreen is reapplied regularly. KELO-COTE® Scar Gel UV with SPF 30 – is available to buy over the counter at selected pharmacies and from Amazon. Signorini M, et al. Clinical evaluation of a new self-drying silicone gel in the treatment of scars: a preliminary report. Aesthetic Plastic Surgery. 2007;31(2):183-7. Kerwin LY, et al. Scar prevention and remodeling: a review of the medical, surgical, topical and light treatment approaches. International Journal of Dermatology 2014;53:922–36. NHS Choices: Emotional effects of scarring. Available at nhs.uk/conditions/scars/#emotionaleffects- of-scarring Accessed 29 November 2017. An online survey was conducted by Atomik Research among 2,000 UK adults. The research fieldwork took place in May 2018. Atomik Research is an independent creative market research agency that employs MRS-certified researchers and abides to MRS code.